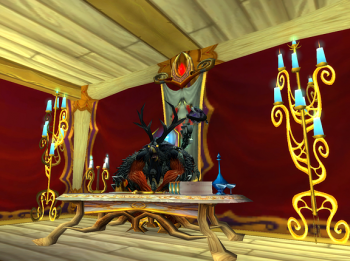 World of Warcraft still has 7.7 million subscribers, despite falling numbers. "We expect to emerge from these transactions even stronger than we are today," says Activision Blizzard's Bobby Kotick on the post-Vivendi era, "an independent company." One with a fairly prosperous balance sheet, it'd seem; its second quarter results show net revenues of $1.05 billion, a slight drop on the previous year's $1.08 billion. Hardly surprising, since last year saw the launch of Diablo III, and nothing comparable came out this year. Solid performers include Call of Duty, which contributed significantly to the digital download section of Activision's financials; digital sales now represent 37% of the company's total revenue. But Kotick's still a little leery about the future, as the changing console generation - which will increase short-term risk for Activision's products - and increased competition make him a little concerned about profits in the second half of the year. Even with the Vivendi buyout, CFO Dennis Durkin says, Activision Blizzard has $3 billion in its war chest. For those wondering what the post-Vivendi era looks like, "approximately 63% of our outstanding shares will be owned by public shareholders, 24.9% will be held by an investor group led by Bobby and Brian and 12% will be held by Vivendi," according to Durkin. World of Warcraft, still the premier subscription MMO, now stands at 7.7 million players, but Activision's hoping the next content update, Siege of Orgrimmar, will lure back some of the wanderers, or at least keep the current bunch occupied. Wondering about Titan? So are we all, but not much was said to investors. "We're in the process of selecting a new direction for the project and re-envisioning what we want the game to be," says CEO Michael Morhaime, and while he was careful to say it probably won't be a subscription MMO, he wasn't in a hurry to say what it will be. "We've gone through this type of iterative development process several times in the past on the way to creating genre-defining games," says Morhaime. But the big point, from Activision Blizzard's perspective, is that it isn't relying on just one title any more. It has plenty of money makers now, and it's happy with its prospects for the future.